Fenchurch Street (often called Fennieabout) runs east-west from the pump on Aldgate High Street to Gracechurch Street in Langbourne Ward, crossing Mark Lane, Mincing Lane, and Rodd Lane along the way. Fenchurch traverses Aldgate Ward and Limestreet Ward. Stow observes that the street is of Ealdgate warde till ye come to Culuar Alley, on the west side of Ironmongers Hall where sometime was a lane which went out of Fenchurchstreete to the midst of Limestreete (Stow 200). Stow lists many possible origins for the name of the street, suggesting that Fenchurch Street took that name of a fenny or moorish ground, so made by means, of this borne which passed through it [...] yet others be of the opinion that it took the name of Foenum, that is, hey solde there, just as Grasse Street tooke the name of grass or hearbes there solde (200). The eponymous church was St. Gabriel Fenchurch, located on the north side of the street between Rodd Lane and Mincing Lane. The church burned down in the Great Fire of 1666, but the street’s name endured. The street is ambiguously labelled on the Agas map, with the name Fenchurch appearing on the street directly below the church building so that the label could refer to either the church or the street. Prockter and Taylor, however, label the street Fenchurch Street (13), as does Richard Blome in his 1720 map of Aldgate Ward with its Division into Parishes (British Library) and Jacob Ilive’s 1739 A Plan of the Ward of Aldgate (rpt. in Hyde 34). Eilert Ekwall offers several other common spellings of the name, including Fancherche and Fanchurche (96). Ralph Tresswell’s 1612 survey of the area provides a detailed view of Fenchurch’s west side at its intersection with Philpot Lane. The property shown, acquired by John Lute in 1541, came into the possession of the Clothworkers’ Company upon his death in 1585 (Schofield 70). This acquisition added to the Company’s already considerable landholdings (see Billiter Lane), and speaks to the immense wealth and power of this livery company. The Clothworkers eventually came to own almost half of Fenchurch Street and profited from renting properties as dwellings and storefronts. The shops along Fenchurch would have had highly visibile to people entering the city through Aldgate, one of the primary entry points into the city. Archaeological excavations have found evidence of rubbish pits likely associated with the processing of animal carcasses for furs and hides (LAARC Site Record FEU008 ). These findings suggest that Fenchurch was home to a wealth of commercial activities including production, trading, and waste disposal. From 1556 to 1557, the Clothworkers’ Company invested funds in the revitalization of the neighbourhood, hiring a carpenter named Revell to spearhead the construction project. This rebuilding led to an increased demand for houses on Fenchurch Street, raising their rental value. A house near Billiter Lane that cost fifty-eight shillings (almost three pounds) per annum prior to 1558 cost eight pounds after the renovations (Schofield 74). Fenchurch Street was on the royal processional route through the city, toured by monarchs on the day before their coronations. These events, rich in pageantry and cultural significance, allowed commoners to welcome [their new ruler] with gifts and pageants (Butler). Surviving eyewitness accounts offer evidence of Fenchurch’s residents preparing for a royal visit. Machyn names Fenchurch Street as one of the primary sites where London’s citizens hung decorations to celebrate the upcoming coronation of Mary I: the citizens began to adorn the city against the Queen’s coronation; to hang the streets, and prepare pageants at Fan Church and Grace Church (1553-09-12).2 Then, when she arrived, Mary travelled from the Tower through London riding in a chariot looking gorgeously unto Westminster. By the way at Fenchurch a goodly pageant with four giants and with goodly speeches[...] (1553-09-30)3. That Fenchurch Street was part of the royal processional route is a testament to its importance as a major thoroughfare. [pass] from the Towre tyll she came to Fanchurche, the people on eche syde ioyoussye beholding the viewe of so gracious a Ladie their quene, and her grace no lesse gladlye notyng and obseruying the same. Here unto Fanchurch was erected a scaffold richely furnished, wheron stode a noyes of instrumentes, and a child in costly apparel, which was appointed to welcome the quenes maiestie in ye hole cities behalfe. Engraving of the triumphal arch at Fenchurch Street by Stephen Harrison. 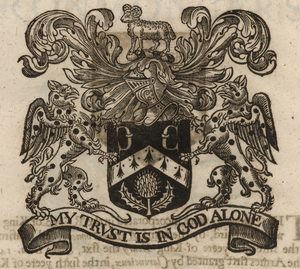 Image courtesy of the Folger Digital Image Collection. As Thomas Dekker records in The Magnificent Entertainment, Fenchurch was the site of the first triumphal arch through which King James I passed when he visited in 1604: from thence stept presently into his Citie of London, which for the time might worthily borrow the name of his Court Royall: His passage alongst that Court, offering it selfe for more State through seuen Gates, of which the first was erected at Fanchurch (sig. B4r). 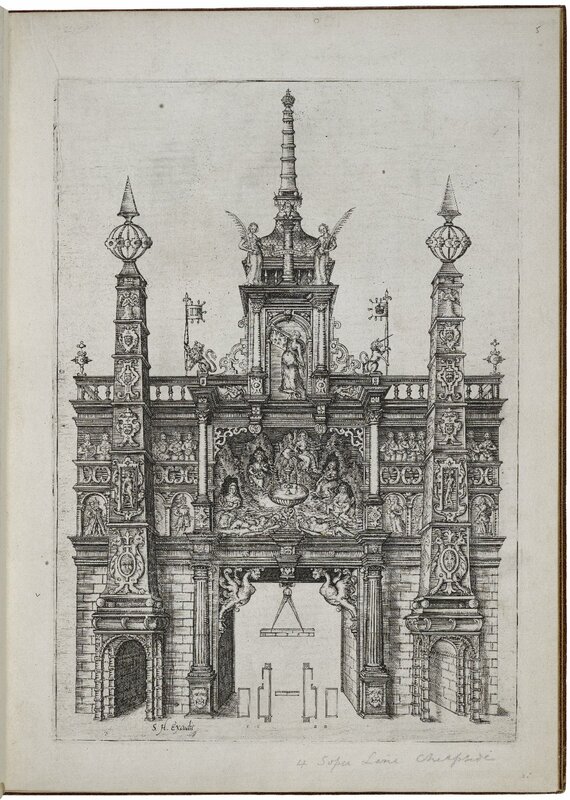 This gate refers to one of seven Arches of Triumph conceived and designed by Stephen Harrison in collaboration with Thomas Dekker and Ben Jonson (Bergeron 445; Chalfant 74). Carved atop Fenchurch’s arch was London itself, populated with a series of allegorical figures attesting to the city’s many virtues (see reproduction of Harrison’s Londinium arch in Chalfant 75; see also the page image in Harrison). Harrison underscored the rich opulence in his design with a series of Latin phrases, carved just above the entrance, paying tribute to both the splendour of the Lord and the British king—in that order. The first phrase is a quotation from the first-century poet Martial: Par domus haec coelo sed minor est domino 4 (75), followed by a phrase of reading Camera Regia 5 written in a lesse and different character (Mardock 32). James Mardock notes in Our Scene is Londonthat while the praise of both city and king are evident, the order and appearance of the two phrases—as well as their proximity to the royal reader’s eye —suggests a hierarchy with the royal domino greater than the civic domus (Mardock 32). Gilbert Dugdale marvels at the workmanship and painstaking detail of this arch in A Time Triumphant, writing such a show of [...] glorie as I neuer saw the like [...] The Cittie of London very rarely artificially made, where no church, nor house of note but your eye might easily find out (sig. B2r). Marry, this is Fenchurch St. and the best way to Crutched Friars is to follow your nose. The play invites sympathy for, or disapproval of, the characters through the differing degrees to which characters share the London habitation of the playgoers. To the playgoer in 1598, the foreigners’ inability to locate or even pronounce London streets would have functioned as a hilarious marker of their unsuitability as husbands for London maids (Jenstad 112). Likewise, Alan Stewart suggests that the strangers’ deeply flawed English is an irresolvable barrier to marriage, and that any union between English and other languages is figured as unhealthy and dangerous (71). The inherent nationalism couched in this exchange arises from the spectators’ satisfaction—at the expense of the intruder—in having a sound grasp of London’s geography and thus being a true Londoner. This geographical confusion cedes a competitive advantage to the English suitors, who use their intimate knowledge (and as the play would argue, ownership) of the land to win the race and obtain the affection of the female characters (Grantley 75). Samuel Pepys describes Fenchurch as one of the streets most severely affected by the Great Plague of 1665. His diary entry on 10 June 1665 records his great trouble, to hear that the Plague is come into the City […] but where should it begin but in my good friend and neighbour’s, Dr. Burnett, in Fenchurch Street; which, in both points, troubles me mightily (1665-06-10). Later, on 6 August, one Mr. Battersby in Fenchurch asked Pepys [d]o you see Dan Rawlinson’s door all shut up? ... one of his men is now dead from the plague and his wife’s sick (1665-08-06). Rawlinson, of whom Pepys speaks fondly elsewhere in his diary, owned the Mitre Tavern in Fenchurch (Wheatley 35). In modern London, Fenchurch Street follows the path of early modern Fenchurch Street from Aldgate to Gracechurch. Fenchurch gives its name to Fenchurch Street Station, the first station to be located within the City of London ( History of Fenchurch Street Station ). Barker, William. Mulcaster, Richard (1531/2–1611): Schoolmaster and Author. Oxford Dictionary of National Biography. Ed. H.C.G. Matthew, Brian Harrison, Lawrence Goldman, and David Cannadine. Oxford UP. Subscription. Bergeron, David M. Harrison, Jonson and Dekker: The Magnificent Entertainment for King James I (1604). Journal of the Warburg and Courtald Institutes. 31 (1968): 445–48. JSTOR. Subscription. Butler, Jennie. Introduction. The Queen Majesty’s Passage. By Jennie Butler. MoEML. Ed. Jennie Butler and Janelle Jenstad. Open. Grantley, Darryll. London in Early Modern English Drama: Representing the Built Environment. New York: Palgrave Macmillan, 2008. Harrison, Stephen. The arch’s of triumph erected in honor of the high and mighty prince. James. the first of that name. King, of England. and the sixt of Scotland at his Majesties entrance and passage through his honorable citty & chamber of London. upon the 15th. day of march 1603. Invented and published by Stephen Harrison ioyner and architect: and graven by William Kip. London, 1613. EEBO. Reprint. Subscription. Haughton, William. English-men for my Money: or, A pleasant Comedy, called, A Woman will haue her Will. London, 1616. EEBO. Reprint. Subscription. STC 12931. History of Fenchurch Street Station. Network Rail. Open. Howard, Jean. Theater of a City: The Places of London Comedy, 1598–1642. Philadelphia: U of Pennsylvania P, 2007. Hyde, Ralph. Ward Maps of the City of London. London: London Topographical Society, 1999. Jenstad, Janelle. Using Early Modern Maps in Literary Studies: Views and Caveats from London. GeoHumanities: Art, History, Text at the Edge of Place. Ed. Michael Dear, James Ketchum, Sarah Luria, and Doug Richardson. London: Routledge, 2011. London Archaeological Archive and Research Centre (LAARC). Open. Mardock, James. Our Scene is London: Jonson’s City and the Space of the Author. New York: Routledge, 2008. Mulcaster, Richard. The Queen Majesty’s Passage. London: Printed by R. Tottill, 1559. SCN 7589.5. Ed. Jennie Butler and Janelle Jenstad. MoEML. Transcribed. Open. Schofield, John, ed. The London Surveys of Ralph Treswell. London: London Topographical Society, 1987. Publication no. 135 of the London Topographical Society. Stewart, Alan. Euery Soyle to Mee is Naturall : Figuring Denization in William Haughton’s English-men for My Money. Renaissance Drama 35 (2006): 55–81. Reprint. ProQuest. Web. Treswell, Ralph. The London Surveys of Ralph Treswell. Ed. John Schofield. Publication Ser. 135. London: London Topographical Society, 1987. Wheatley, Henry Benjamin. London, Past and Present: A Dictionary of its History, Associations, and Traditions. London: J. Murray, 1891. Reprint. 3 vols. Detroit: Singing Tree P, 1968. Kaufman, Noam. Fenchurch Street. The Map of Early Modern London, edited by Janelle Jenstad, U of Victoria, 20 Jun. 2018, mapoflondon.uvic.ca/FENC1.htm. Kaufman, Noam. Fenchurch Street. The Map of Early Modern London. Ed. Janelle Jenstad. Victoria: University of Victoria. Accessed June 20, 2018. http://mapoflondon.uvic.ca/FENC1.htm. Kaufman, N. 2018. Fenchurch Street. In J. Jenstad (Ed), The Map of Early Modern London. Victoria: University of Victoria. Retrieved from http://mapoflondon.uvic.ca/FENC1.htm. Czar of Russia and grand prince of Muscovy. Property owner who took freedom from the Drapers’ Company in 1573. Chronicler and member of the Merchant Taylors’ Company. First Russian ambassador to England, sent by Ivan IV in 1557. Sheriff of London from 1553—1554 CE. Mayor from 1556—1557 CE. Member of the Merchant Taylors’ Company. Vintner. Resident of Fenchurch Street and owner of the Mitre Tavern. Carpenter. Surveyor and Master of the Carpenters’ Company. Mincing Lane ran north-south from Fenchurch Street to Tower Street. All of the street was part of Tower Street Ward except the corner house[s] towardes Fenchurch streete, which were in Langbourn Ward (Stow). Stow notes that the street was named after tenements there sometime pertayning to the Minchuns or Nunnes of Saint Helens in Bishopsgate streete (Stow). Stow also makes a definitive link between the lane and London’s commercial history. The Clothworkers’ Company was one of the twelve great companies of London, formed in 1528 out of the merger of the Fullers and the Shearmen. The Clothworkers were twelfth in the order of precedence. 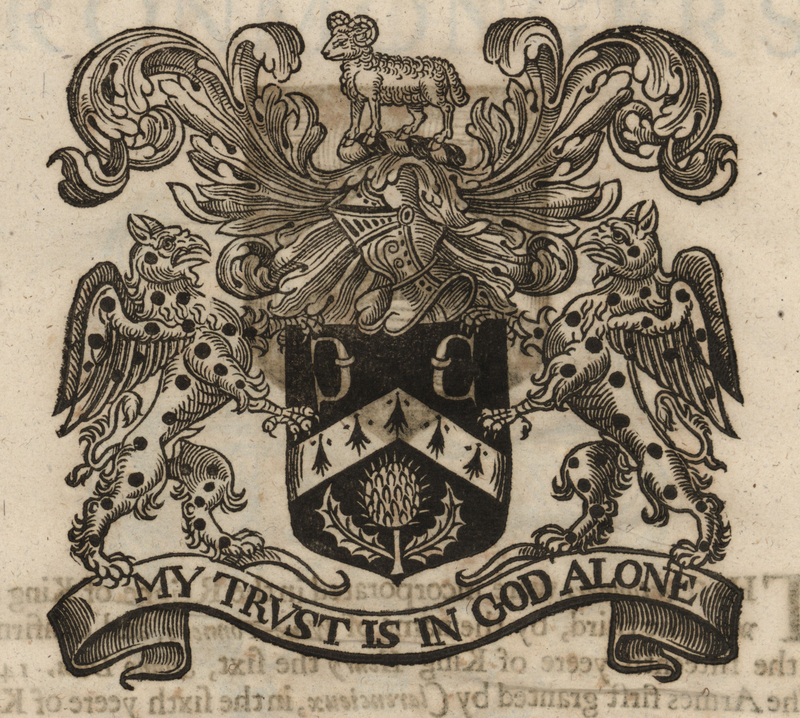 The Worshipful Company of Clothworkers is still active and maintains a website at http://www.clothworkers.co.uk/ with information about its history. The Merchant Venturers’ Company of London was one of the lesser livery companies of London. Documents using the spelling Fenchurch St.